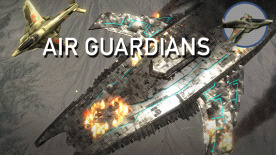 Air Guardians is a flight combat game set in the distant future. A world government is attempting to seal their grip on power, and an air force of advanced fighter craft is called upon to fight them. Fight through grand spaceship battles, night time base raids, orbital shipyard assaults, and more!